Marine holding tanks are made to easily be installed on your boat, yacht, cruiser or any other marine vessels. If you're after a durable waste holding tank made to hold up to the rigors of sea travel then these are the holding tanks for you. 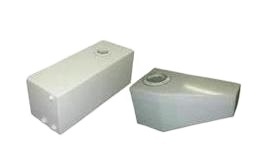 *Replacement custom made marine holding tanks are available by request. *Marine Waste Holding Tanks are manufactured from incredibly strong Polyethylene Plastic Resins built to last.